Join in for an evening of Buffy themed Giveaways, Trivia, and Cosplay Contests! DVD Boxed Set available for Pre-order at San Diego Comic-Con. Los Angeles, CA (June 27, 2017) – Iconic cult classic Buffy the Vampire Slayer continues its 20th anniversary celebration during San Diego Comic-Con with a special fan event hosted by Legion M in conjunction with 20th Century Fox Consumer Products. Coinciding with San Diego Comic-Con, the “Buffy the Vampire Slayer: 20 Years of Slaying” fan event will be held Saturday, July 22 from 6-9 pm at Side Bar in the Gaslamp Quarter (exact address is 536 Market Street). Fans interested in attending the “Buffy the Vampire Slayer: 20 Years of Slaying” event can register on the official Buffy Facebook page here. A portion of this event will also be livestreamed to this Facebook page. · Buffy Fandom Feud Trivia Contest - Fans will get the opportunity to win Slayer Swag as they team up to show off their Buffy knowledge! · Buffy Cosplay Contest - Damian Beurer co-host of Super Power Beat Down, and executive at Legion M, will host this Buffy Cosplay showdown. Calling all Buffy Cosplay fans to bring their best Scooby Gang cosplay for the opportunity to win Slayer Swag! · Once More, With Feeling! – At the party, fans can show-off their improv skills when they get to reenact their favorite Buffy show moments. 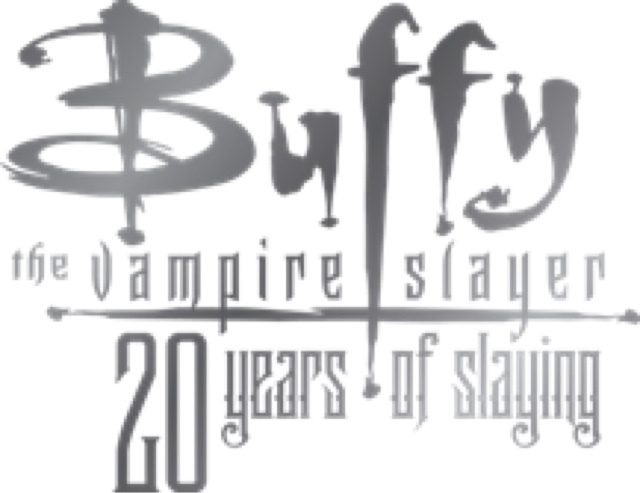 · Fans will be treated to select appetizers and a Buffy 20th anniversary cake as they sip on signature Slayer drinks, available during the event. 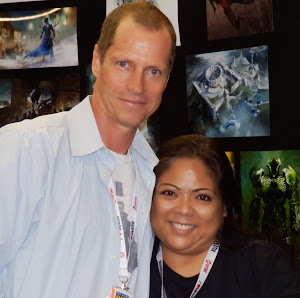 · Photo opportunity with a life-size image of The Gentlemen from the popular episode "Hush." Fans who share on social media will receive an exclusive spell in a small glass vial, a perfect keepsake for Buffy fans, from the forthcoming book Buffy the Vampire Slayer: The Official Grimoire (Insight Editions, October 2017). 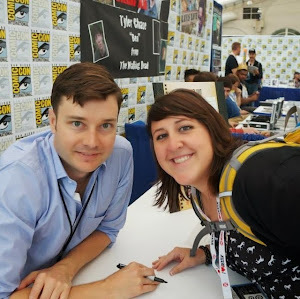 · Various stations including an in-person Buffy table-top board game competition from Jasco Games, and an interactive wall-sized Buffy coloring book pages from Dark Horse. Fans will be able to color and create their own Buffy art for a special digital mosaic in celebration of #BuffySlays20! · Plus, additional giveaways and surprises! Also at San Diego Comic-Con, fans will have the opportunity to pre-order the Buffy the Vampire Slayer: The Complete Series 20th Anniversary Edition DVD boxed set at the Fox Booth #4229 for $99.98. Available everywhere on September 19, 2017, the DVD collection includes an official “Buffy” Dark Horse Comic Book featuring an exclusive cover available to fans for a limited time. The teen years can be brutal. Especially when you’re Buffy Summers (Sarah Michelle Gellar) – a Sunnydale High School student destined to slay supernatural, blood-sucking baddies instead of hanging out at the mall. Over the seven seasons of this thrilling, witty show, Buffy struggles to maintain allies in the fight against evil, while also engaging in on-off romances with a moody vampire (David Boreanaz) or two (James Marsters). Now you can own this 39-disc set containing all 144 episodes of one of the smartest, funniest, most action-packed series ever to slay on the small screen – also starring Alyson Hannigan, Anthony Head and Nicholas Brendon. 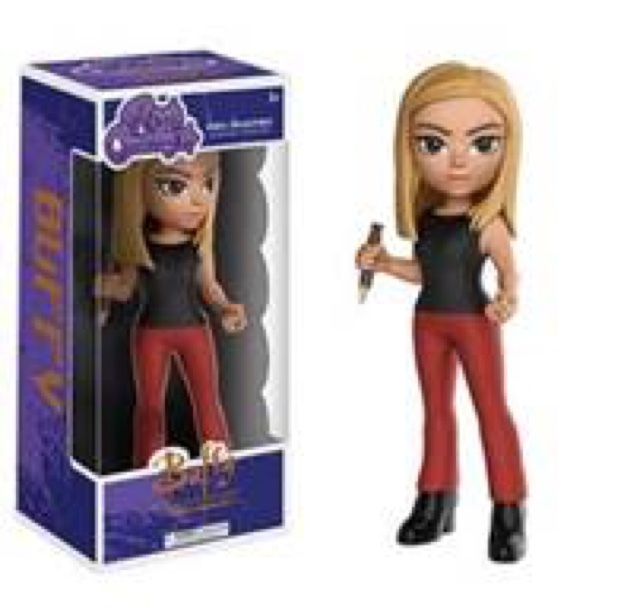 · Coming this August, Buffy the Vampire Slayer is joining the Funko Rock Candy line! Unable to escape her destiny, this series includes the Vampire Slayer herself, Buffy Summers, and her academically-excelling counterpart Willow Rosenberg…Together they’ll save the world! Add them both to your collection this Summer. · The eagerly awaited Buffy the Vampire Slayer fashion collection is now available online at hottopic.com. Hot Topic, the retail destination for music and pop-culture inspired apparel, accessories, collectibles and more, is celebrating 20 years of slaying with a fashion collection inspired by the style of beloved Buffy characters. The line features six pieces including Willow’s iconic 90s sweater, a long trench coat inspired by Buffy, a black motorcycle jacket inspired by Faith, a white high-low dress inspired by the dress worn by Buffy in Prophecy Girl, as well as tops featuring iconic lines from the series. Join the Buffy the Vampire Slayer 20th Anniversary conversation with #BuffySlays20 and #BuffySlaysSDCC. 20th Century Fox Consumer Products licenses and markets properties worldwide on behalf of 20th Century Fox Film, 20th Century Fox Television and FX Networks, as well as third party lines. The division is aligned with 20th Century Fox Television, the flagship studio leading the industry in supplying award-winning and blockbuster primetime television programming and entertainment content and 20th Century Fox Film, one of the world’s largest producers and distributors of motion pictures throughout the world. Legion M was created in 2016 by Paul Scanlan and Jeff Annison, two of the Emmy winning founders of MobiTV. The company is using the JOBS Act to become the first media company built from the ground up to be owned by fans. Legion M's mission is to unite 1 million fans to bring boldly original film, TV and virtual reality projects to market. In August of 2016, Legion M closed a historic, oversubscribed equity crowd-funding round, raising over $1.2MM from over 3,100 investors. In March 2017, Legion M received SEC clearance to open their Reg A mini-IPO to up to $50M (round it open at wefunder.com/legionm). The company moved quickly to build a slate of film and TV projects, including the April 7threlease of COLOSSAL, an imaginative sci-fi feature starring Anne Hathaway and Jason Sudeikis, and directed by Nacho Vigalondo; FIELD GUIDE TO EVIL, a global horror anthology produced by Alamo Drafthouse CEO Tim League and Ant Timpson; ICONS: FACE TO FACE, a groundbreaking virtual-reality interview series launching with comic-book visionary Stan Lee interviewed by Kevin Smith; and PITCH ELEVATOR, a digital TV series and Comic Con experience that offers fans the opportunity to win a film or TV development deal. Allies and advisors include Stoopid Buddy Stoodios (Robot Chicken, Supermansion), Tim League (Alamo Drafthouse, NEON), Adam Rymer (President of Legendary Digital Entertainment, Nerdist, Geek & Sundry), Scott Landsman (Head of Comedy TV, Sony), Lisa Taback (award winning publicist), Kerry O'Quinn (founder of Starlog and Fangoria), Stan Lee and more.